How music can be freely downloadable and the musicians alive and kicking! Today great music, starting from the Brazilian, is slowly going to be free from copyright chains, lycensed under Creative Commons (or Copyleft), and other good music will follow, but years ago there was just a few number of groups who started the Steal-our-Music Revolution. This is an Italian/French “co-operative jazz band” called Chaussette Verte that is making its own success thanks to internet and the free music revolution. When the correct way, for the bands "discovered" by the corporations, seems to be to clonate any success, to defend the high prizes of the CDs and to sentence to death the ones who make copies of them, we play the music we love, our CDs are freely downloadable from the net and can be freely copied in as many copies as anybody want to do. 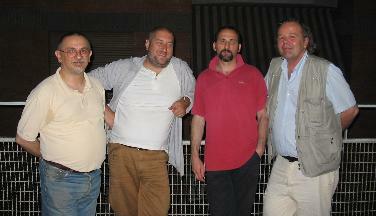 On july 2001 we recorded our first CD not believing we where going to sell a single copy: pure spontaneous improvisation is not so popular, and we are an about 40 years old too fat not a prettyface boy band. We published only on the web (vitaminic, iuma, mp3.com, and others), giving to the listeners the choice to buy the CD or to download it for free (from our web site http://chaussetteverte.tripod.com). From the first we made the on line distribution our choice for both economic (we didn’t wanted to spend money in a 1.000 copies production, without any selling chanche) and political (we think that copyrights are an obstacle to the culture circulation and developement) reasons, today is a part of the idea we have of a correct and up to date way to be in the arts universe. This first CD had (few, but) good reviews and has been unexpectedly successful in terms of public's appreciation (in 2001, from september 17th to december 21th our CD was at the first position in the top jazz-blues SELLERS charts and close to the 1st position in the main charts in the italian Vitaminic site, www.vitaminic.it, it also appeared in the french one). We have a fan club on vitaminic web site (OK, in there are just 20 fans, but they are 20 more than in our dreams)!!! After these selling results we actually are or have been on the playlists of some USA and Europe radio stations (incredible for an Italian unknown jazz band). In december 2003 we recorded the second album: Aux arts, citoyens!, it’s free on our site, had a wounderful review on the swiss site Almaren and is lycensed to a Californian indie.